VANCOUVER - Dave Dickenson is thankful the Canadian Football Hall of Fame considers quality over quantity. Dickenson was among seven individuals named for induction in Canada's football shrine Friday night. Joining Dickenson in the player's category are Leroy Blugh, Eddie Davis and Gene Makowsky while Montreal Alouettes owner Bob Wetenhall, former CFL player, coach and GM Bob O'Billovich and longtime amateur football coach and administrator Larry Reda will go as builders. Dickenson, 41, spent 10 seasons as a quarterback with the Calgary Stampeders and B.C. Lions. In 143 career games, the native of Great Falls, Mont., completed 67.5 per cent of his passes for 22,913 yards with 154 TDs and 50 interceptions. 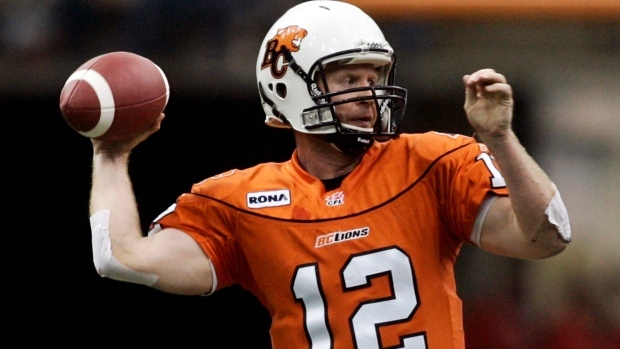 Dickenson is the second-most accurate passer in CFL history behind Ricky Ray of the Toronto Argonauts (67.6 per cent). Dickenson was the CFL's outstanding player in 2000 and won two Grey Cups, earning game MVP honours in '06 with B.C. Dickenson was hampered by injuries throughout his career, something he's glad voters didn't hold against him. "I'm very appreciative," Dickenson said. "More than anything I was just happy the voters decided to vote on quality over quantity. "There's certainly an argument out there both ways but I felt when I did play I was with the best in the game." The date and location of the '15 induction ceremony wasn't immediately available. The new inductees will boost the Hall of Fame's membership to 278. Dickenson, currently Calgary's offensive co-ordinator, is preparing to face the Hamilton Tiger-Cats in the Grey Cup game Sunday at B.C. Place Stadium. While the timing of his induction isn't exactly ideal, it doesn't diminish the significance of the honour in Dickenson's mind. "It's important to me," he said. "Every one of us wants to leave a mark, or at least I do. "You want to do good things not only for yourself but you want to make sure you're remembered in a positive way. The validation of a Hall of Fame (nomination) is people respected what you did and respected how you played and obviously you played well enough to get into that super elite club. "I'm very happy about it, they can't take it away from me. I know a lot of the history and believe in this type of stuff. I've been to the Hall of Fame in Hamilton multiple times. To me, it's a pretty big accomplishment." When players go into baseball's Hall of Fame, they must choose which team's cap they'll wear during their induction ceremony. Dickenson is thankful he won't have to decide between a Stampeders or Lions hat when he goes into the Canadian Football Hall of Fame. "I had some great years in Calgary and to me a lot of great years in Vancouver," he said. "It would've been an interesting deal if you had to put a hat on." Dickenson is especially happy to be in the same induction class as O'Billovich, a fellow Montana native. "I think it was time to put him in as well," Dickenson said. "He was a good player, coach, general manager . . . he pretty much did it all." O'Billovich's CFL career spanned five decades as a player, coach and general manager. The 74-year-old native of Butte, Mont., played five seasons as a defensive back and quarterback with the Ottawa Rough Riders from '63 to '67 before serving as an assistant coach with the squad from '76 to '81. He became the Toronto Argonauts head coach in '82 and spent eight seasons there, winning his only Grey Cup in '83. He also served as the B.C. Lions head coach/GM ('90'-92), returned to the Argos as head coach/GM ('93-'95) and also served as Hamilton's GM ('08-'12) before retiring. Blugh, 48, played 15 seasons in the CFL as a defensive lineman with Edmonton and Toronto. He won a Grey Cup with the Eskimos in '93 and was named the league's top Canadian in 1996. After his playing career was over, Blugh served as the head coach at Bishop's, his alma mater, from '05-'10 and two seasons as an assistant at Queen's. Last year he was the defensive line coach for the Ottawa Redblacks. Davis, 41, played defensive back for 15 seasons with Birmingham, Calgary and Saskatchewan. His best season was '98 when he had 77 tackles, three sacks and four interceptions for the Stampeders. A two-time Grey Cup champion, Davis was also named a CFL all-star on four occasions before retiring prior to the 2010 season. Makowsky, 41, a native of Saskatoon, spent his entire 17-year career with Saskatchewan. A five-time league all-star, Makowsky was twice the CFL's top lineman ('04-'05) and a finalist in '08. He appeared in a club-record 284 career regular-season contests and another 16 in the post-season before retiring after the '11 season. In 2013, Makowsky was also inducted into the Riders' Plaza of Honour. Reda has been involved in minor football in B.C. for over 50 years and in 2011 received the Commissioner's Award from CFL commissioner Mark Cohon. He was also honoured by the NFL's Seattle Seahawks for his longtime service. Wetenhall has owned the Alouettes since 1997 and the club has appeared in eight Grey Cup games, winning three, over that span. Wetenhall was a primary figure in the expansion and restoration of Percival Molson Stadium on the campus of McGill University and in '11 received an honourary Doctor of Laws Degree from the school, it's highest honour.